I was lucky enough to have been sent to Orange County Fashion Week by Uber. I am honored to report back on what a fabulous experience it was. What I loved about Orange County Fashion Week was that designers presented looks that could be worn very soon - in the coming weeks or months - as opposed to most major fashion week shows where we get a glimpse of what will be trending for the next year or season. Perhaps that's one of the many perks of OC life - fresh fashion is readily accessible. I saw intricate crochet crop tops, breezy tie-dye caftans, versatile shape-shifting swimwear and easy gowns that looked suitable from beach brunch to belle of the ball. 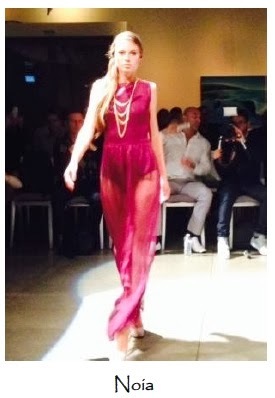 OC Fashion Week kicked off with resortwear and men's intimates at the Seven Degrees venue in Laguna Beach. With a beautiful red carpet, brand-new Vespas on display and pop-up shops ranging from jewelry to hats to beauty, the atmosphere was welcoming and fun. 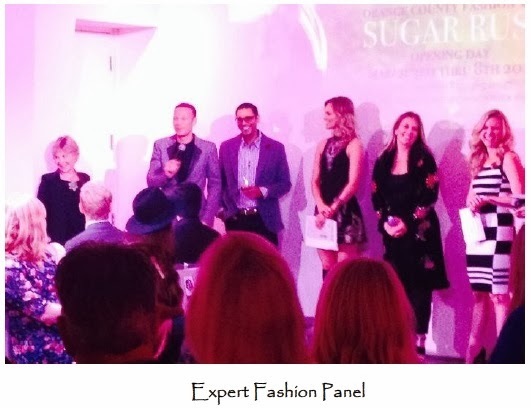 The night started with an expert fashion panel including Neel Grover, CEO of Bluefly.com; Rose Olson Januzzi, COO of Chinese Laundry; Lash Fary, CEO of Distinctive Assets; Kelli Ellis, Celebrity Interior Designer and Sarah De Anna, supermodel and author of the book Supermodel You. Noia showed some of the coolest coverups I've seen with ultra chic body jewelry as the perfect accent to take your day from poolside to pre-dinner drinks. 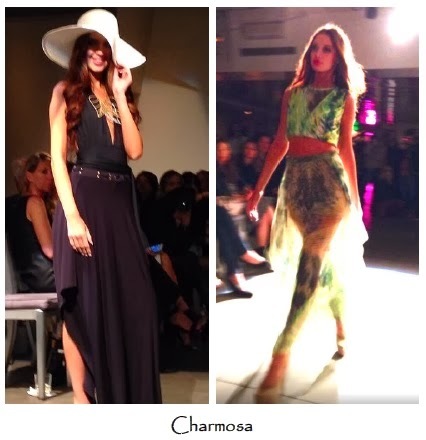 Charmosa Swimwear came from Brazil to show her designs. She did feature bikinis and one pieces, however for me, the standouts in her collection were the maxi dresses that seemed to float down the runway. Indie Soul's collection was decidedly tribal in influence with ethnic beaded elements and tie-dye patterns. This fringed crochet top is one I could definitely see paired with jeans and heels or on the way to the beach this Spring and Summer. The second night was held at the incredible Lyon Air Museum at the Orange County Airport. 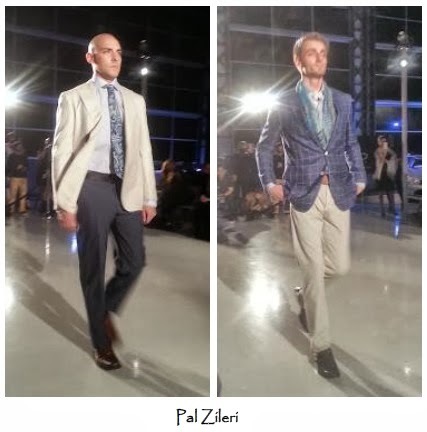 Set amongst vintage airplanes and the newest luxury car models, this night of menswear designs was definitely swanky. Celebrity stylist Daniel Musto was a stylish and delightful emcee for the evening. 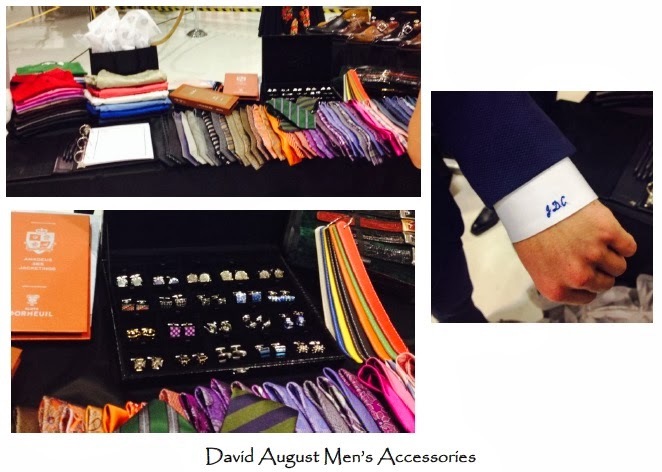 One of the featured pop-up shops was David August, Inc., which creates custom menswear ranging from polo shirts to tuxedos. Their clients consult with them and each item is measured to fit the man perfectly. They also have gorgeous accessories such as ties and cufflinks and they can monogram any piece of clothing as well. 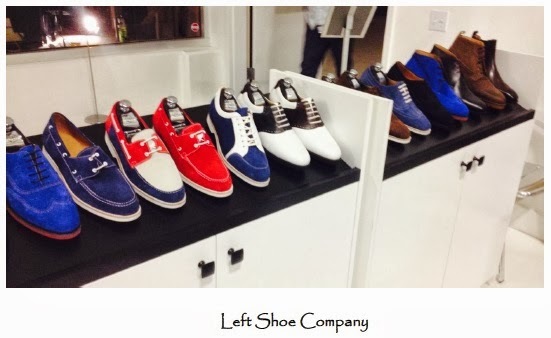 Another of the pop-up shops on night two was The Left Shoe Company, which uses innovative 3-D scanning to create stylish made-to-measure men's shoes. 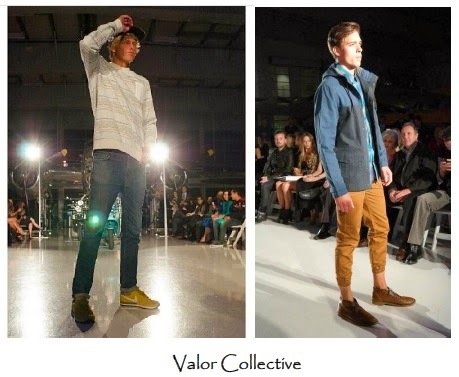 Valor Collective's laid-back looks were perfect for the guy who wants to look put-together and stylish even in his casual wear. The high-end streetwear featured many interchangeable separates. Popular surfwear company Rip Curl featured their boardshorts, tees and California-cool activewear. The Orange County Ballet Theatre preformed in between each fashion show, with exceptional pieces geared to express the theme of each preceding designer. Pal Zileri's stunning collection of elegant menswear featured suits and separates in fine Italian fabrics and super chic color combinations. The impeccably tailored styles were the epitome of the modern gentleman. The splashy and sophisticated restaurant, Anqi, was the host venue of the avant garde night of OC Fashion Week. Highlighting local and international designers who push the limits of fashion, the night was full of fascinating creations. 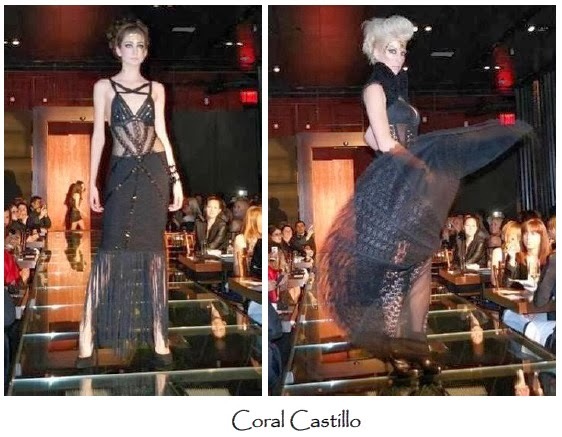 Coral Castillo's designs were a standout of the night. Using embellishments and an all-black palette, the pieces seemed at the same time light and structural. 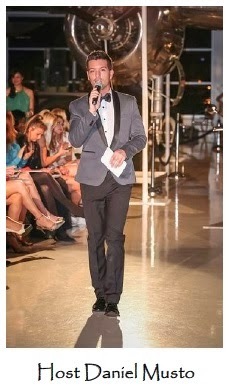 The final night of Orange County Fashion Week was held at Dawson Cole Fine Art Galley in Laguna Beach. In the outdoor courtyard, dotted with graceful sculptures and waterfalls, the night celebrated Orange County's local designers who give back to the community. It also highlighted OC Fashion Week's 2014 charitable cause: HomeAid Orange County, the founding chapter of a national non-profit organization with the vision and purpose to end homelessness. Ansari Haute Couture is the design house of Nasrin Ansari, who uses unique fabrics and fine detailing on her creations. The styles were decidedly European and sensational. Dan Richters Couture designs are artful and otherworldly. How appropriate that his collection was entitled "Vessel". The gold and black pieces in rich textures featured embellishments fit for a warrior queen. Beyond the elegant structure applied to each design, what was so striking on the runway was that every other model was en pointe, pacing the catwalk on the tips of her toes. The idea was inspired, adding to the transcendent value of the finale collection of Orange County Fashion Week.